I made this dress to mimic my favorite outfit from TS3 (with a few tweaks and variations) but close enough to what I was looking for. 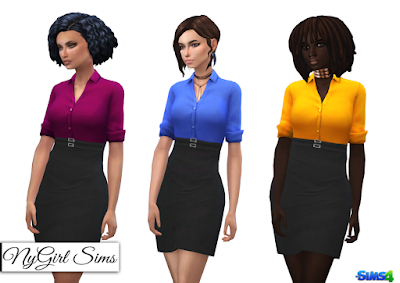 It's a simple business style outfit with colored collared shirt and a double belted high waist black skirt. Made from a mixture of TS3 and TS4 textures. Mesh edit by me. Comes in 26 colors. it is a sims 3 package file. All my creations on this site are for Sims 4 only. I no longer make custom content for Sims 3.